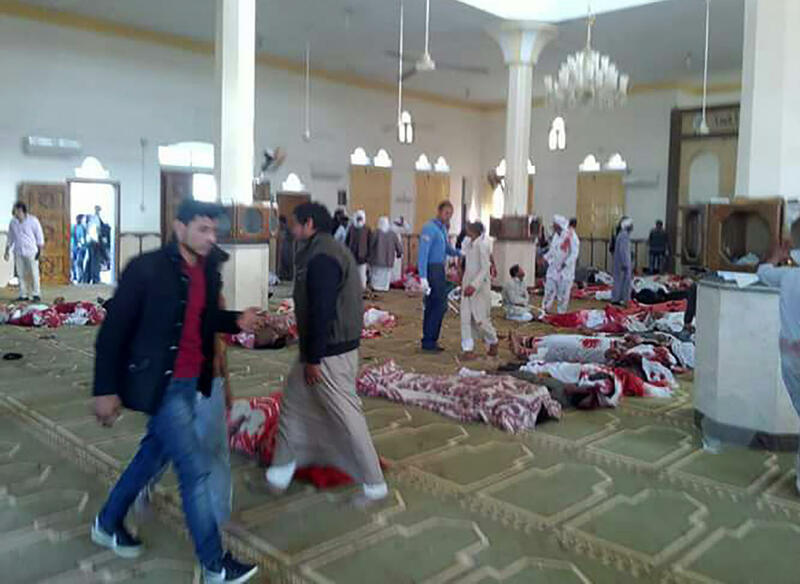 EL-ARISH, Egypt -- Militants attacked a crowded mosque during Friday prayers in the Sinai Peninsula, setting off explosives, spraying worshippers with gunfire and killing at least 235 people in the deadliest ever attack by Islamic extremists in Egypt. The attack targeted a mosque frequented by Sufis, members of Islam's mystical movement, in the north Sinai town of Bir al-Abd. Islamic militants, including the local ISIS affiliate, consider Sufis heretics because of their less literal interpretations of the faith. President Donald Trump condemned the "cowardly" attack on Twitter, and took the opportunity to tout the need for a border wall and travel ban, even though his most recent ban doesn't affect Egypt. He also said he would be speaking with Egypt's president, Abdel-Fattah el-Sissi, later Friday. Egyptian president Abdel-Fattah el-Sisi has condemned the extremist attack on a mosque in the troubled Sinai Peninsula, calling it "criminal" and "cowardly" and expressing condolences to the victims and their families. In a statement after the meeting, el-Sissi said the attack "will not go unpunished" and that Egypt will persevere with its war on terrorism. The suffering of the victims was not in vain, he added, and will only "add to our insistence" to combat extremists. Addressing the nation later on television, he repeated his view that Egypt was fighting a battle for the rest of the world.